twin in the city: golden hour. 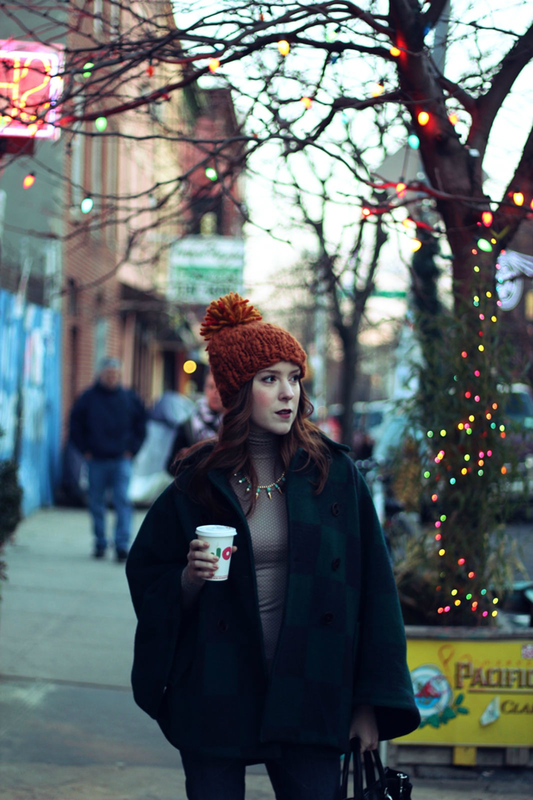 this past saturday, twin and i found ourselves all bundled up, braving the winter weather in williamsburg, brooklyn. only a few stops from our apartment, this little trendy town has drawn us towards it for about a year now, and is even more enchanting wrapped up in christmas lights, with that delicious pine needle air. we found the local tree farm and hung out by the balsam cedars for as long as our chilly fingers would let us. grabbing some thai food and perusing the local shops in search of unique christmas gifts while mariah carey's "all i want for christmas" filled our ears made for a wonderful afternoon, just the two of us. staying warm while remaining stylish can seem like winter's biggest challenge, but not with the perfect wool coat that can be draped over any outfit. i found this one a couple years back, and it's doubled as a blanket ever since ;) this winter, my eyes are locked on this edgier version. a turtleneck can serve as a great heat-locking base to any winterized look, and pairing it with a glitzy necklace adds depth to an otherwise simple staple. happiest of holidays to you! what styles are keeping you warm this winter? You look so perfect in that hat! I love the fun color of it! Wow I love this! Your beanie is so perfect! Wow, great outfit! (: Love your beanie, it's so cute! Adorable photos! Love your beanie great color. Love this outfit so much! The hat is adorable. Your blog is adorable! Stumbled across it on Gal Meets Glam. Will definitely be following! I absolutely love this! That jacket is such a beautiful color, and I love the hat! 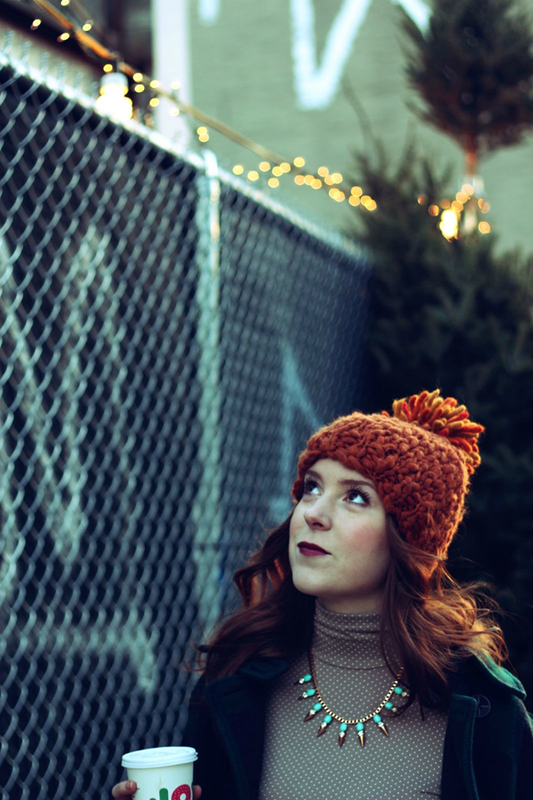 mostly i just really want a big pompom hat, because who wouldn't?! you look really great with vampy lips. not many people can pull that off, but you look great! Nice outfit! Super cute hat! lovely photos and cute hat! Cute and cozy look! I like your jacket and hat. You have a nice blog, let me know if you want to follow each other to stay in touch. I'll follow right back. Have a great day & Happy Holidays ! This outfit is adorable and you look super chic. I <3 those knee high boots, thrifted necklace and that cute beanie. Hey you didn't share the complete look of your twin! 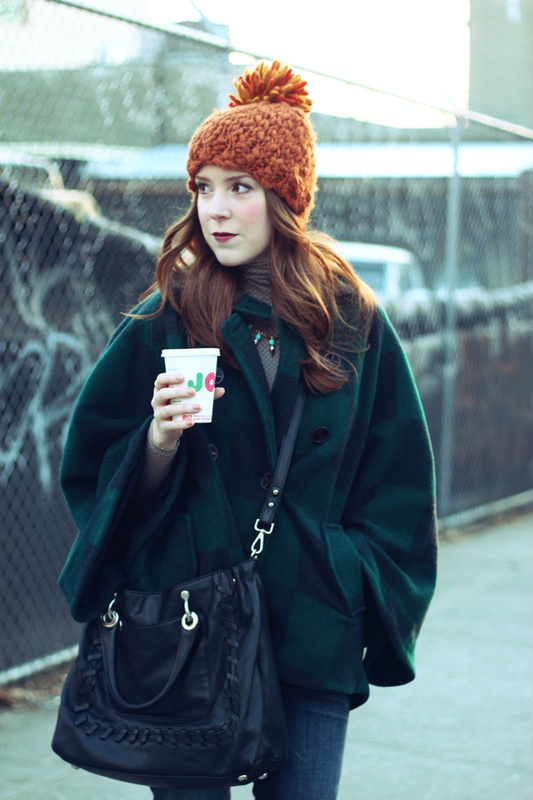 love the blue & green plaid coat with orange pom pom hat...looking comfy chic for the cold weather! You look lovely! Thanks for the follow! that beanie is perfect. seriously. love the color!